Biscotti has always evoked the feeling of quaint Italian cafes that sell expensive (yet delicious) coffee. It’s one of those cookies that makes you feel more refined when you eat it. With Nonni’s Biscotti Bites, you can enjoy the refinement and flavor of Biscotti without having to fly to Italy. 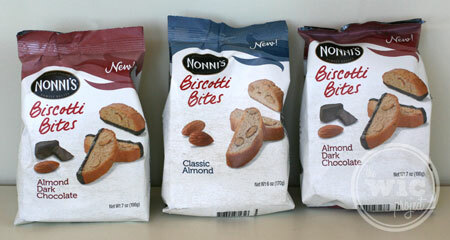 Nonni’s Biscotti Bites are available in 3 delicious flavors – Almond Dark Chocolate, Caramel Milk Chocolate, and Classic Almond. Each Biscotti Bite is a mini-size version of biscotti that can be eaten in 2-4 bites (depending on bite size of course.) Because of the special bite size and bag, they are a convenient snack option for yourself or for sharing with your friends. I enjoy my Nonni’s Biscotti Bites while looking out at the view of the lake. A cup of my Salted Caramel Hot Chocolate is the perfect accompaniment, although you can also enjoy it with coffee (of course) wine, milk, or even by itself! Some of you may be biscotti dippers, but I enjoy taking a bit of the crispy cookie and then following up with a sip of my hot chocolate. Some biscotti is very hard, almost like you’d chip your teeth eating them, which makes me feel like they’re old or stale. Nonni’s Biscotti Bites have a great crisp to them without being too dry or crumbly, giving a clear impression that they were freshly baked. I was able to try both the Almond Dark Chocolate and Classic Almond Biscotti flavors. They were delicious! The Classic Almond flavor has a surprising sweetness with nice almond slivers baked into the biscotti. The Almond Dark chocolate has the same tasty almond flavor but also has a hint of bittersweet from the dark chocolate which is coated on one side. Nonni Biscotti Bites are a great snack to enjoy a little “me time.” To celebrate those special moments that we can take for ourselves, Nonni’s is hosting the Biscotti Moment Sweepstakes. Simply submit your photo of your Biscotti Moment, and you’ll be entered to win a weekly prize of a Nonni ‘s Biscotti Gift Basket. Enter the Sweepstakes and you’ll have a chance to win a trip for two to Hollywood! The Sweepstakes ends on June 15, 2012, so get your entries in now. 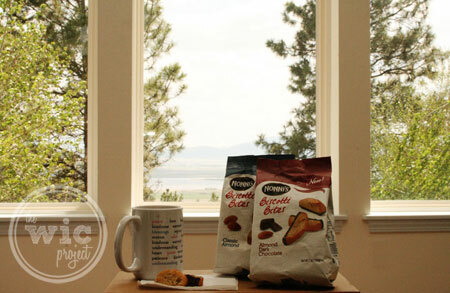 Here’s a shot of how I enjoy my Nonni’s Biscotti Bites – with a view! 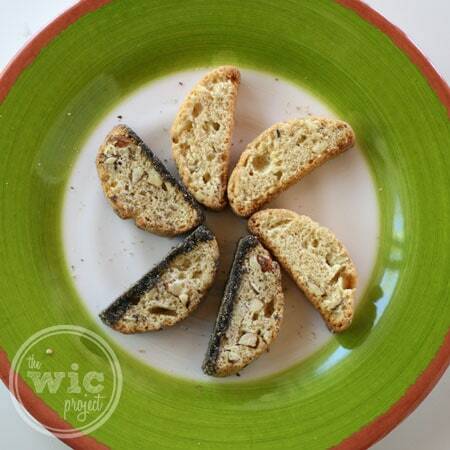 How do you enjoy your biscotti? Disclaimer: I wrote this review while participating in a campaign by Mom Central Consulting on behalf of Nonni’s Biscotti and received a product sample to facilitate my review and a promotional item to thank me for taking the time to participate. All opinions are my own. 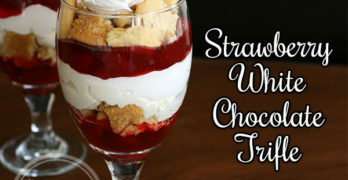 These look yummy I will have to try these out. The Almond Dark Chocolate sounds delicious, especially with salted Caramel hot chocolate. Yum! yummy, I’ve had the bigger ones, so I’m sure these are just as good! Our family buys Nonni’s Biscotti Bites for celebratory gatherings and holidays. Somehow, we appreciate the more when related to a happy time!